LOS ANGELES — So desperate for goals before the Olympic break, it appears as if the drought in Los Angeles is over. The Kings scored 11 goals in the last 60-something hours, capping off their third game back from the Olympic break with a 3-1 win over the Panthers Saturday at Staples Center. It was their fourth win in as many games, dating back to early in February when they defeated the Blue Jackets in overtime, and it’s the type of hockey the team thinks they should have been playing the whole time. "We had some things to correct going into the break and we, other than the guys that were at the Olympics, we had a good four or five days of practice to help correct those things," said defenseman Alec Martinez, who scored the game-winning power play goal in the third period. "We’re scoring goals and we’re playing our game." The Kings have now outscored their opponents 13-6 over the course of that winning streak, a feat that seemed highly unlikely before the break when they were shut out in three of their final seven games and went five-straight games without a power play goal. Saturday’s Kings looked nothing the like the Kings of old, scoring early in the game and then finding a way to bear down in a strong third period with the game still tied at 1-1. Mike Richards scored on a sharp angle shot from Robyn Regehr in the first period, and a shot deflected off Regehr 39 seconds later tied the game. Martinez netted a power play goal in the third before Justin Williams scored an empty net goal later in the period, giving the Kings the decisive victory. "I saw Dustin Brown turn and I knew he was going to throw it at the net so I thought that maybe a rebound would creep out," Martinez said. "I just start creeping down and when I saw, I think there were two big guys behind me, I knew I had to go short side and fortunately it went in." "You guys will talk about the goal but he played really well on our end," said goaltender Jonathan Quick. "He made some big plays and was breaking up plays on our end. He played good for us." Los Angeles is now eight points ahead of Vancouver in the Pacific Division Standings and sixth in the Western Conference. 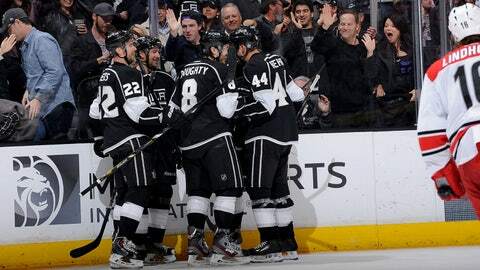 Since coming back from the break, the Kings have played especially well in the third period, scoring five goals. While not all problems have been solved, it appears as though the team is on the right track. "It’s no secret that we weren’t happy with our game before the break started," Martinez said. "This is crunch time here, it’s playoff hockey from here on out so we know that we have to have a good 23 games and hopefully roll it into the playoffs."